We all will save lots of important data such as photos, videos, files, etc on our Computer or Laptop drives. Isn’t it? But, we have a fear of security like the recent malware attack called Ransomware or someone could have access it when we are far from our system. Do you want to protect your data? Do you want to hide and encrypt your data with strong security? Then you are at the right place. Today, we are going to tell you the method of protecting and encrypting your files on a USB drive where you can take backup of your entire data. Having a backup of your data is always the best idea. You might think like this, what if I lost my USB drive? What if the stolen people access my data? Do not worry about it. In the methods given below, you can hide files in your USB drive too. Read the article to get the answers for all your questions. Here, I am going to explain about protecting our important data on a USB drive with encryption process. We always don’t want to encrypt the total drive. Instead, we want to encrypt only a few files which are more important. For this, there is a very simple option that is to protect the file with password individually. There are many programs which support the possibility of creating a security password to a file, as in the case of Office. With the Microsoft Office suite, we can encrypt a file in Word, Excel or Powerpoint. The choice is yours. Go to the first information tab. There is an option Protect Document at the beginning. Click on it and you will get an option Encrypt with Password. That’s it. Enter the password and save the file. Your file is protected now. To protect PDF files, we can use different programs that are available online. If you want to protect other types of files, one option is to use WinRAR or 7zip to protect them with a security password. You can also select the option to hide the files that are inside the protected one. The only discomfort of this method is that we will have to unzip the file every time we want to use it. In a positive way, the protection is very strong. If you just want to save only a certain number of files and not all the files that are there. For this, we can make an encrypted partition on our USB drive. To do this, there is one of the most useful programs named as Rohos Mini Drive. It does not require administrator permissions and is a free version which allows us to create a partition of up to 2GB with 256-bit AES encryption. In addition to this, it allows us to access the encrypted files anywhere. The disk is created according to your requirements. The protected files or a folder is accessible by pressing Rohos Mini.exe in the root of the USB memory. Once the password is entered, the partitioned drive is mounted as a separate drive, which is accessible through the file browser. To unmount it, give a right click on the unit and expel it. The most direct and radical option is to encrypt the entire USB drive safely. To perform this action we have many programs which help to encrypt USB drives, where you can find Rohos Mini Drive or Veracrypt. We can also use BitLocker, the windows encryption software for all types of drives. That is it!. These are the 3 ways to protect and encrypt our data on a USB drive. Easy isn’t it?. I hope this article helps you to improve security to your data. If you have any queries in any of the methods which are mentioned above, let us know in the below comment section. We will get back to you solve all your queries as soon as possible. 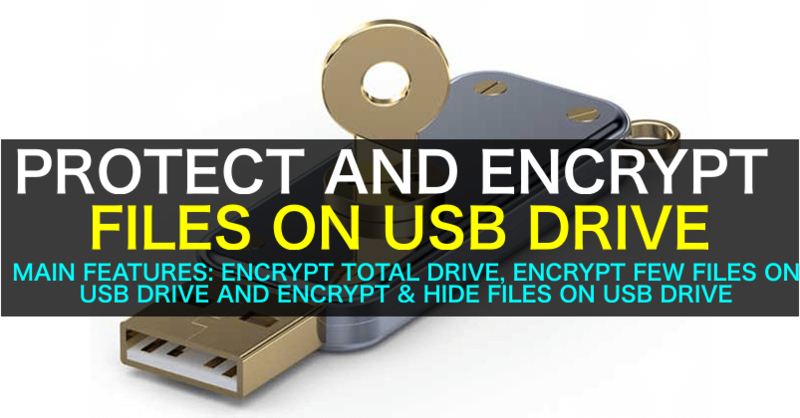 If you know any other methods to protect our data with USB drive, share them with our readers through the comments in the below section or you can mail us at [email protected] We will go through your method and after perfect implementation, we will include in our article in the next update. Which method do you use to protect and encrypt your data on USB drive?